I can totally envision this sweet, sweet crochet pillow sitting in a white rocking chair in the corner of a baby girl’s bedroom. 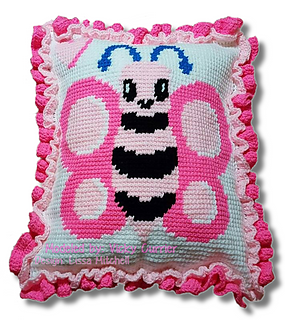 The friendly little butterfly, the bright pops of color, and the love put into every stitch make it the perfect decoration for a new baby’s nursery. It would even make a wonderful addition to an older girl’s bedroom! My kiddos have always been SUCH fans of their bedding….they hoard blankets and pillows. 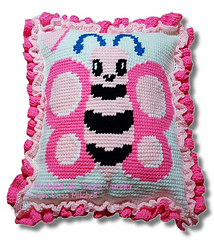 So I know they would love this adorable butterfly pillow pattern too. PATTERN NOW CONTAINS WRITTEN INSTRUCTIONS FOR BOBBLE AND C2C ALSO TO MAKE A THROW BLANKET!